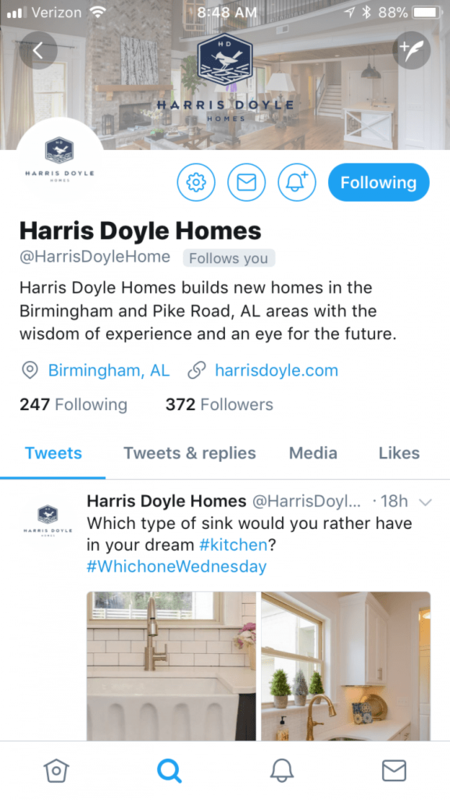 When we first started working for Harris Doyle Homes, a popular Birmingham, Alabama home builder, in 2013, the builder wanted to improve its blogging and social media presence. Since their website launched in 2011, they had posted just a handful of blogs. They had a social media presence with profiles on Facebook and Twitter, but needed a better plan for how to use these sites. Upon starting our marketing program with Harris Doyle, we immediately implemented a content strategy designed to keep content flowing regularly to the website. A regularly updated blog provides a variety of benefits. First, the consistent updates provide the search engines with regular content to crawl, giving your site additional opportunities to rank for keywords and show up in searches. It is also a great avenue for disseminating company content across various platforms, like social media sites, newsletters and more, all while driving new traffic to your website. In addition, a blog allows you to establish yourself as an authority in your field or on your subject. Today, Harris Doyle’s blog is updated around four times per month, providing potential buyers with new information on available homes, new communities or models, local events and much more. The most popular blogs on the website average around 150 visits within the first 30 days of being posted. To date, the most popular blog ever posted announced Fieldstown Crossing, and it garnered 3,663 visits. Another community announcement, posted in 2016 about Griffin Park at Eagle Point, came in second place with 2,632 visits. Social media is a powerful tool that, when used correctly, can drive a substantial amount of traffic to your website. Just like content, social media requires a strong, focused strategy that is tailored to the specific audience on each site. For example, most Twitter audiences tend to skew male, while Facebook is still dominated by females in terms of audience engagement for brands. This means your message may need to differ slightly from one platform to the next to catch the attention of your target market. In addition, your social strategy must include content that is fun, engaging and perhaps most importantly, eye-catching. When you successfully implement a social strategy, you’ll notice as social traffic numbers to your website climb, engagement on each site increases and your online presence grows! When we first began working with Harris Doyle in 2013, the website averaged around 1,200 visits per month with social sites being responsible for around 100 of those visitors. Today, social media sends about 500 visitors per month to the website! Within the first year of working with Harris Doyle, there was an increase of 500 percent on Facebook, as the brand’s page climbed to nearly 1,000 likes. At the same time, the average post reach had increased from around 60 to over 400. Today, the Facebook page has more than 3,000 followers! We also saw increases in Twitter, which has nearly doubled in followers since we began working with Harris Doyle. In addition, Harris Doyle Homes has expanded its social reach with profiles now active on YouTube, Pinterest, Instagram and Google+.